Native Americans called the region Mauch Chunk because the mountains resembled a sleeping bear; Olympian Jim Thorpe, hailed one of the world’s greatest athletes is entombed in the town which now bears his name. A rich anthracite legacy is a cornerstone for “The Switzerland of America”, where the spirits of The Molly Maguires are said to make their presence known from time to time; and music of Bach and Handel is celebrated with gusto. 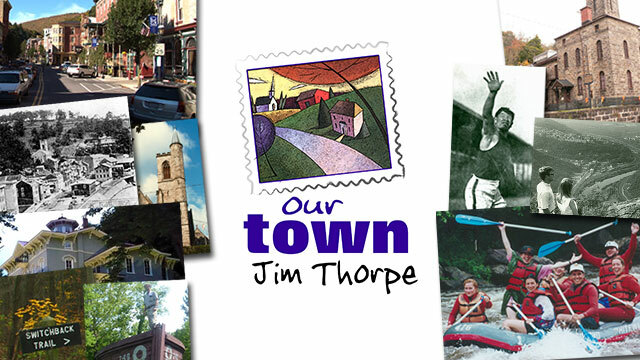 Residents from Jim Thorpe, Pennsylvania volunteered their time to become videographers and storytellers for “Our Town: Jim Thorpe”. The residents narrowed down which landmarks, events and local stories the documentary would explore. Each subject was assigned to a volunteer to videotape and participants were then interviewed about why they chose to become involved. As northeastern Pennsylvania’s and the central Susquehanna valley’s public television station serving a very large geographic area, the “Our Town” project was initiated in an effort to involve the communities and their residents with WVIA. The “Our Town” documentary series is intended to treat viewers to the many personalities, perspectives, and possibilities that local towns have to offer.